InvestorCentric: U.S. Debt Offerings: The Biggest Ponzi Scheme In History? U.S. Debt Offerings: The Biggest Ponzi Scheme In History? The U.S. Treasury has not been able to keep up with the monetary demands from the Fed which lead them to request the authority to print their own debt. In what has to be considered a ridiculous run up in the national debt of late, this move just compounds the potential problems. This is leading some people to question the validity of U.S. sovereign debt. Is the U.S. government running the biggest ponzi scheme in history? It sure seems like it. Toni Straka from The Prudent Investor looks closer at this in his blog post below. Ladies and gentleman, fasten your seat belts in anticipation of more monetary madness. In its drive to keep the helicopters above Wall Street (and certain privileged corporate headquarters) filled with colourful stacks of fiat money that can be showered onto everybody that is deemed too big to fail the Federal Reserve blueprints a new layer of debt, writes the Wall Street Journal on Wednesday. According to the story based on sources "familiar with the matter" the Fed considers to issue its own debt. This would allow the Fed to circumvent banks as intermediaries, possibly leading to a recovery of capital markets. But it could also lead to a situation where the Fed would be a direct competitor to the US Treasury in debt issuance. While the privately owned Fed's right to print unbacked fiat money is already constitutionally doubtful (see my sidebar) even the Federal Reserve Act does not explicitly permit the Fed to issue debt either. As chairman Ben Bernanke religiously follows a policy of the easiest money ever in order to combat what will become a bigger depression than the 1930s Ben is looking into new ways to drop Federal Reserve Notes all over the world. 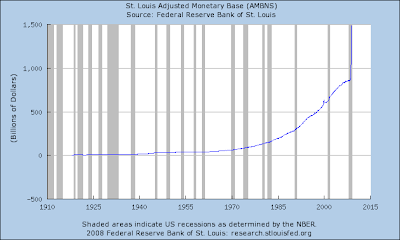 Always remember that chairman Ben Bernanke has become the biggest and fastest money printer in the history of mankind by now, doubling the monetary base within a week. It took 95 years for the first 750 billion. Ben added the same amount last November. The WSJ reasons that the Fed has to make a move because of the explosive growth of its balance sheet and the questionnable quality of its collateral. What the WSJ does not ask is whether the continuation of the game of unlimited funny money is another desperate attempt to keep the biggest Ponzi scheme of all times running a little longer. Without ever expanding credit the whole FRN scheme is destined to fail as did ALL other unbacked fiat currencies before. ...Fed officials have approached Congress about the concept, which could include issuing bills or some other form of debt, according to people familiar with the matter. ...There are also questions about the Fed's authority. "I had always worked under the assumption that the Federal Reserve couldn't issue debt," said Vincent Reinhart, a former senior Fed staffer who is now an economist at the American Enterprise Institute. He says it is an action better suited to the Treasury Department, which has clear congressional authority to borrow on behalf of the government. I conclude the Fed is looking for ways to fuel future monetary hyper inflation in truly creative ways. This move comes only 2 months after the Fed had announced unlimited FRN refinancing in collaboration with other major central banks. Bernanke is of the stubborn opinion that the last depression was a result of too tight monetary policy. While this may be true to a certain extent we have no reality based example that a zero interest rate policy has helped averting an economic downturn that stemmed from too much easy money in the first place. It was the Fed that refused to recognize the unsustainable property bubble. It appears this was not their first mistake and it will not be their last one. This article has been reposted from The Prudent Investor. The full post can also be viewed on The Prudent Investor.